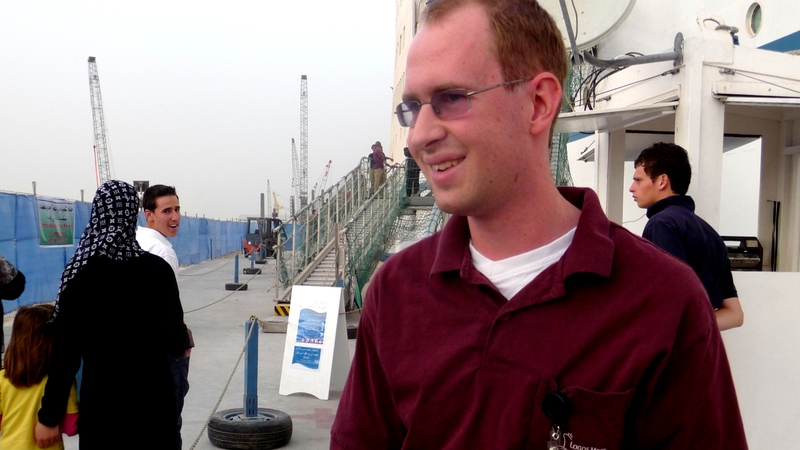 “Thank you for visiting Logos Hope, the world’s largest floating book-fair, my name is Chris and I’m from Australia”. I’m speaking on a microphone before a small crowd of people who have just arrived at the ship after a long wait and a bumpy bus ride. They are about to enter the book fair and browse our selection of books, and it’s my job to tell them how to work out the price of the books and where to find the bathroom. In speaking briefly with one of the crowd he said to me “I am so glad that you are open again this week because I was unable to come before – and I brought my family with me”. You see this week is unlike any other time I have been on the ship. We have been delayed by two weeks in Sri-Lanka because some repairs took longer than we hoped. So we opened the book fair again and sent people out to tell the city that we are open again – but unusually we aren’t hosting any events so there is very little work to do in AV. For this reason I was able to live my dream this week and work in the book fair for 6 days. I have volunteered my time there often when they are short on staff, but only for an hour or two here and there. I have prayed for the opportunity to work there for a longer time without leaving AV and this week God said ‘Yes!’. He is good! To see first-hand a variety of people of different walks of life and beliefs on the ship and browsing our good books and meeting crew members gives me a new perspective on what God is doing on this ship and new enthusiasm for this ministry.